When it comes to opposites, it’s all a matter of perspective! Lively text and fun retro art engage kids in the finer points of a favorite concept. Do you know opposites, yes or no? On. Off. Asleep. Awake. Opposites are a piece of cake . . . right? Not so fast! Time for a quick double take. Who knows what’s BIG unless there is SMALL? Does SHORT mean a thing except next to TALL? What is ABOVE and what is BELOW? The answer depends on who wants to know! Writer Susan Hood and illustrator Jay Fleck lead us on a topsy-turvy fun-house journey into the concept of opposites and takes it to the next level — with detours into relative terms and points of view (and a dollop of yin and yang for good measure). Jay Fleck’s artwork has been featured everywhere from the Gap to the front page of Society6.com. 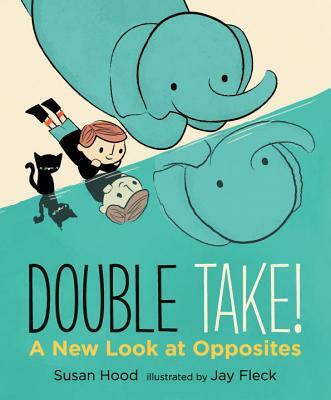 Double Take is his picture-book debut. Jay Fleck lives with his family south of Chicago. Hood’s rhyming prose gradually builds to a scene of a wild roller coaster ride, where she asks the reader to ‘do a quick double take.’ Fleck’s picture shows the cat tied to a helium balloon, but the cat is above and the balloon is below — a clue that proves that the right-side-up book is now upside down. It’s a satisfying highlight to a stimulating book. Readers are encouraged not to take things at first glance: an abstract composition of colored circles turns into a huge painting of a butterfly when viewed from a distance...Ideal for the thoughtful, deliberative child. The brief rhyming text sets a playful tone, which is heightened by the cartoon-style digital illustrations...the simplicity and humorous touches make this engaging, useful, and fun—a winning combination. Through rhyming text, this unassuming picture book clearly conveys the concept of perspective (“where you are can affect what you see”) and advises readers to “consider all sides”: a powerful and timely message. The classic sans serif black font injects some fun into the retro-style digital illustrations. Charming details make this book a pleasure to revisit. It’s a thought-provoking book that will prompt questions for child readers about perspective and point of view.